In summary – “Mangal Dosha” is a condition far too easily diagnosed by astrologers without much grasp of the science. Mars is the planet of energy, and thus can easily become agitated, competitive and agressive. We don’t want too much of that type of stuff coming into contact with our Marriage and romantic relationships, right? Naturally. The 7th House is the focal point for such relationships – so when Mars is in a position to directly affect the 7th House there is the potential for “The Stain of Mars” to arise. The places from which Mars can directly affect the 7th House are houses 12, 1, 4, 7 and 8. As you can see, that’s an awful lot of houses. More than a third of people should therefore have Mangal Dosha – so statistically alone you should understand that having Mangal Dosha is not the end of the world in and of itself. An astrologer should be more picky about what actually creates a situation worthy of being called “mangal-dosha”. For one thing, Mars should affect the 7th House directly in more than one way. The more angles that Mars connects to the 7th House, the more the situation is worthy of being called a “Stain” or a “Fault” to marriage and relationship karma. For example, Person A has Mars in the 12th House. Most astrologers will claim this is Mangal Dosha and scare the hell out of the person. However it’s not. There are a list of ways mangal dosh is cancelled, and there is talk of it becoming ineffective at the maturity of Mars (28 years old) – but I’m not even going to go into that here. I am simply saying that this person does not have Mangal Dosha because Mars is only connected to the 7th House from one angle. Person C has everything Person B has, but additionally has the Moon in his 9th House. That would mean that Mars would aspect the 7th House from the Moon in addition to everything else. Person C I would try to disuade from marriage and encourage to develop an energetic career or something similar. Person D has everything Person C has, but additionally has the Lord of the Moon’s 7th House in his 6th or 7th or 3rd houses (where the aspect of Mars falls). This person would have 4 Counts of Mars influencing his marriage and relationship karma. I might blatantly tell such a person to never get married. But even then there could be other positive or negative factors affecting the relationship karma besides Mars! 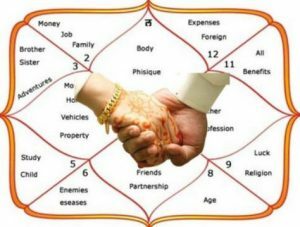 To know more, you can discuss directly with our panel of expert astrologers.